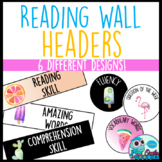 I created this reading focus wall headers and title for my own personal use. 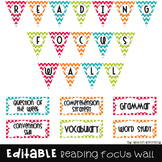 We are adapting a new reading series this year, so I wanted to create a new focus wall. 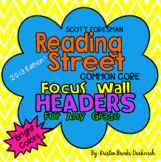 There are 6 bright colored headers! I included 6 blank ones as well! 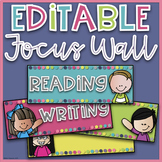 I also created a title for my focus wall. 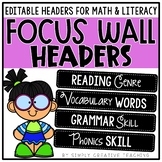 Focus wall headers for the McGraw Hill Wonders curriculum. There are four headers per page and there is an additional page of blank headers. 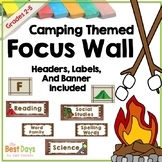 Focus Wall Headers & Letters with EDITABLE Headers!! !